distribution This is another Northern meadowhawk, but its range extends southward in the mountains to northern GA. In NC, it is found mainly in the mountains and foothills of the Piedmont, but there are a few records in the northern Piedmont away from the mountains (Rockingham, Caswell, and Franklin counties). abundance Uncommon in the northern mountains, but rare in the central and southern mountain counties; rare in the Piedmont foothills; very rare east of the foothill ranges in the northern Piedmont. We have no recent reports from east of the mountains/foothills, which clearly indicates that the species has declined in recent decades in the Piedmont. flight Mid-June to mid-September in the mountains; early June to early September in the Piedmont. habitat Unusual for most dragonflies, it favors marshes, bogs, and wet meadows for breeding. behavior Adults forage from tips of grasses and sedges in or very close to marshes and bogs. comments Because this species seems to be tied to a fairly limited and specific habitat -- marshes, wet meadows, and bogs -- it can be specifically searched for. As the basal half of each wing is amber in color, coupled with the dull reddish abdomen, the male is quite unmistakable. 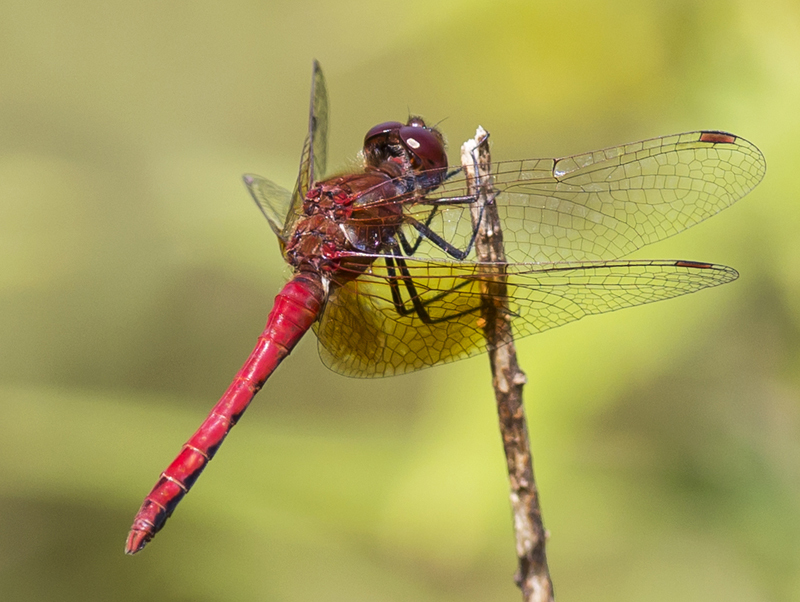 It is more widespread in the mountains than is the White-faced Meadowhawk, which also can occur in cool/cold bogs, marshes, and other open wetlands. Comment: Watauga, 2017-09-04, South Fork of the New River, Clawson-Burnley Park, Boone. - 5 males, 1 female. At the retention ponds. Female.